That's what I told a fellow writer yesterday when he said he'd been feeling a bit stuck. More specifically, he said he felt like he had an "inability" to write recently. I pointed out it wasn't an inability so much as an unwillingness to do what had to be done. Those stagnant moments weren't a result of him being incapable of doing the work. He's one of the most capable writers I know. They were instead a result of choices he made along the way. In this case we were talking about blogging. But the same is true in freelance writing.Every choice can be the difference between success and being perpetually stuck. Let's take a hypothetical look at the kinds of decisions that might get you into trouble as a freelance writer. Start by imagining a rough day. You're blocked -- the worst case of writer's block you've ever had (which I don't believe in by the way, but that's a post for another day). You have an article to draft for one client. You want to get a blog post up on your professional site. And you have some pitches to send new prospects. But you aren't doing these things. You're sitting there, staring at your screen for what feels like (and might actually be) hours. And that screen never magically fills with words as you secretly hoped it would. You had choices to make during that time, and even before, that could have helped you move forward rather than sit there spinning your wheels. But you made some mistakes. For example, maybe you got stuck on your client's article because you felt unsure of the direction or weren't thrilled with feedback you received after interviewing a source the client insisted on. Plow through it anyway as previously planned. Go back to the interview source for a follow-up. Go to your client for clarification or to discuss possible tweaks or concerns over the idea (like suggesting another interview source). Move on to one of the other tasks you had to do, and come back to this with a fresh head later. You probably had more options than that even, but let's keep it simple. What did you do to get stuck? You went with the first option. You tried to just push through it. You froze up. And now you're stuck, not sure what to do or what to write. Why? Because somewhere in you, you knew that wasn't the right approach. You felt something was wrong with the piece, and you didn't trust yourself enough to try to improve things. Why didn't you choose one of those other options that might have given you a new direction or additional material to work with? Because you were afraid you'd look incompetent telling a client there might be a problem with the initial plan or telling your interview source you messed up by not getting the information you really needed. I'd say "that's silly." But it's not. Fear isn't silly. It can be downright crippling. And it's often the root of bad decisions freelance writers make. What about that last option? Why didn't you move on to something else? Maybe you had a deadline looming. But sitting in front of a blank screen did nothing to get you closer to a finished article, did it? It can leave you worse off than when you started because you add discouragement to the mix. Perhaps you're just being too hard on yourself, thinking as a professional you have to be able to force yourself to do these things whether you want to or not. But you're also not some child being told to sit there until you finish your broccoli. You're allowed to spice it up if you want to. Or you can say "you know what? I don't want broccoli right now, so screw this. I'm making mashed potatoes." Treat yourself to what you really want. Do something you can finish or enjoy more, and come back to that broccoli project later (and I'm totally going to start calling everything I hate to do a "broccoli project" from now on). Being a bit more thoughtful about these kinds of decisions can go a long way to preventing slumps. But what happens if it's too late, and you're already stuck, reading blog posts like this one instead of writing what you should be writing? We just talked about this, but it bears repeating. If you get stuck on one project, it's okay to set it aside and work on something else. Not feeling a client project right now? Write a post for your professional blog or knock out a few pitches. This is one of the reasons I keep a 5-minute list in Todoist. When I feel myself slipping into one of these funks, I pull up that list and complete one short task. Sometimes that's enough to make me feel better. I've accomplished something. And sometimes I'll do several of those. The confidence in my ability to get things done increases every time I mark something else as complete. You don't always have to do other work though. If you're really having a rough time of it, get away from work completely. Go make a pot of tea and sit outside in the sun for a while. Go for a walk. Play with your pet. Take a nap. Read a book. Don't necessarily take the rest of that day off (though that's okay too sometimes). But spend 30 minutes to an hour doing something you take pleasure in. The idea is to lift your spirits and recharge yourself rather than punishing yourself for struggling, which will do nothing to help the situation. A far better option is to talk to someone. And it should be someone who actually knows what they're talking about -- not just a friend or spouse or whomever. Make it a colleague. Or even your client. Bounce ideas around. Maybe they'll have a different perspective or be able to get you to think about your project in a new way. Maybe your gut is telling you that you picked the wrong approach when you pitched your article. Don't be afraid to contact the client about tweaking that idea a bit. The worst that'll happen is they say "no." You might even let someone read what you have so far. Maybe it's not nearly as bad as you think. The negative emotions keeping you stuck are coming from you. So let someone else weigh in, and it might give you the kick you need to either keep going or change course so you can move in a better direction. 3. Figure out your underlying fears. Back to those negative emotions that lead to bad decisions and get you stuck in the first place... in my experience, it's usually tied to fear. Maybe you fear your work won't meet a client's expectations. Perhaps you fear your article is dull and no one's going to want to read it. Impostor syndrome might be your problem, where you feel like a fraud, as if you're not qualified to write about something (when you actually are). Or maybe you're just afraid in general -- that you'll fail as a freelance writer -- so everything feels overwhelming. Spend some time on self-reflection. Figure out the underlying problems or concerns or fears that are causing you to make those choices that hold you back. Until you do that, you risk repeating past mistakes and slowing down any progress towards your goals. I suggested something to this fellow writer who was feeling stuck, and it would make for a good Monday Motivation exercise this week. What can I do today to get me one step closer? It doesn't have to be something big. In fact, it should be something small -- nothing that could potentially overwhelm you. The idea is simple: Make a promise to yourself that, today, you're going to do something to get you closer to your goals. That might mean a short business task. Or it could revolve around better self-care. Or it might mean removing negative influences from your life (a "friend" who discourages you or a bad client who doesn't value you or who treats you like crap). Or it might mean improving something about yourself because when you grow as a person, your business will follow. Within minutes of telling this fellow writer to write those questions down and keep them where he would see them every day, I realized something. I am such a damn hypocrite. Did I talk it out with someone? No. Did I do anything productive to help me move past it? No. I found excuses to take most of two days off though. Did I even try to reflect on why my own fears and other emotions might be screwing me over professionally? Nope. I mean, in this case I already know why. But I didn't do a damn thing to try to work though those things. Did I do anything else at all with that time? Sure. But outside client stuff, most of it was useless. Some of it was behind-the-scenes work. But I did maybe 20-30% of what I should have done last week. So yeah. I'm a hypocrite. It's easy to be the third party observer and see what tends to lead a friend or colleague into one bad choice after another. It's much more difficult to do that for ourselves. Because of that, I've added this exercise to the start of every day on my schedule. I won't even begin work until I do that "one small thing" that's going to get me closer to where I want to be. It's not important that you put this first each day. 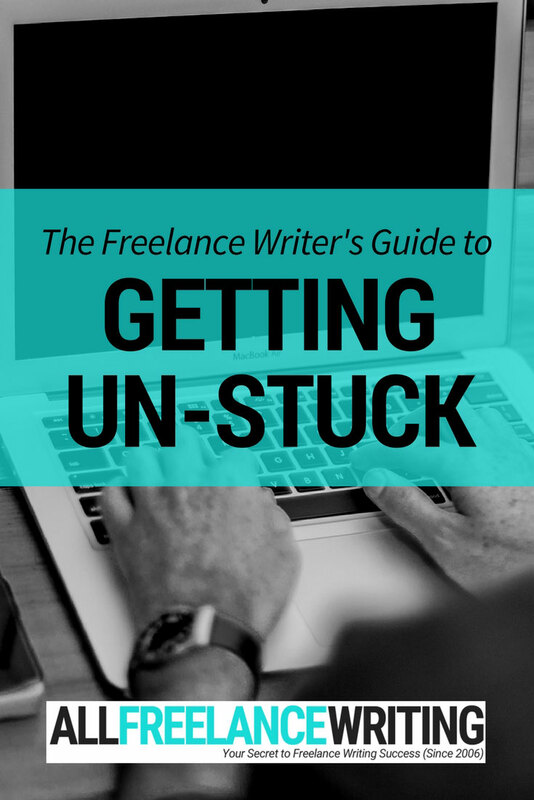 But it is important that you make the effort... because the best remedy for feeling "stuck" in your freelance writing career is staying on-course in the first place. Now tell me... what do you do to get un-stuck? Been there, done this, too. I think we all procrastinate, but it’s not always a bad thing. I know I procrastinate when I’m just damn tired from plowing through the work. I’ll put the small stuff off so I can unwind. But the big stuff. Yep, that’s bad when we procrastinate on the big stuff!